Please note: The beverage packages can only be booked for the duration of the cruise and for all persons accommodated in the cabin. Minibar is not included. Guided tour of Porto, the birthplace of port wine, including wine-tasting in a winery. Excursion to the pilgrimage site Lamego, with its impressive open-air staircase and Gothic cathedral. Excursion to the magnificent Baroque Mateus Palace in Vila Real with its beautiful park-like garden. Numerous members of the nobility settled in Vila Real between the 15th and 17th centuries. The main attraction of the city is the Mateus Palace, which was the mansion of the last Count of Vila Real. The Baroque building is located in a lovingly maintained park with bizarrely cut hedges and ancient trees. The Count's gardens are one of the most the most beautiful places in Europe. You will also enjoy sightseeing in the Palace. Day excursion to the Spanish university town Salamanca with its impressive cathedral and Plaza Mayor (including lunch). Come with us to Castelo Rodrigo, one of the 12 historic parishes of Portugal, some 670 m above sea level. For centuries Jews, Arabs and Christians lived together here in peace. Because of the almond trees the medieval town is known as “the white city”. Come with us to view the ruins of the castle and the palace, wander through the cobbled alleyways and discover façades from the 16th century and window ornaments in the famous Manuelino style. Guided tour of tranquil Pinhão, including a visit to the famous station, decorated with blue and white ceramic tiles. Excursion to the “Cradle of the Portuguese Nation”, Guimarães. Excursion - Follow the footsteps of the Portuguese explorers in the “World of Discoveries” Museum. We reserve the right to make changes to the itineraries and excursion programmes. If a route cannot be taken due to low / high water levels or a defect in the ship, the shipping company reserves the right to provide the guests with buses or hotel stays on this route, or to use another route. It may be necessary to transfer to another ship. 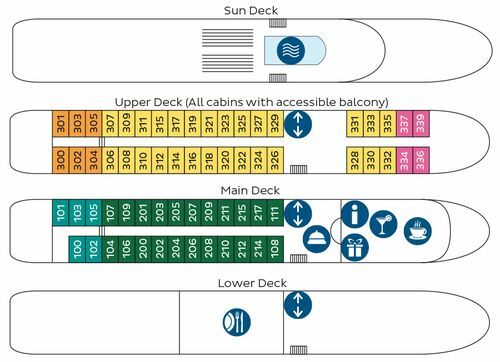 Minimum number of travellers required for this cruise by 30 days before the cruise begins: 100 persons (see Point 8.1. of out Travel Terms and Conditions).